Albany, Tuesday, January 29: A broad coalition of advocates, formerly incarcerated people and community leaders from the Release Aging People in Prison/RAPP Campaign, Parole Preparation Project, he #HALTsolitary Campaign, Osborne Association, Brooklyn Defenders Services, Chief Defenders Association of New York, New York State Association of Criminal Defense Lawyers, and state lawmakers rallied during the NYS legislature’s budget hearing on public protections in support of significant changes to the state’s parole release process. The coalition demanded that Governor Cuomo’s executive budget proposal include funding to fully staff the State Parole Board and to support advocate-led efforts to release older people from prison. They called on the Assembly and Senate to pass legislation that will ensure parole release is based on rehabilitation and individuals’ current risk to public safety (S497/A4346); a bill to establish elder parole for incarcerated older people (S2144/A4319), and to support a fully staffed and rehabilitation-based Parole Board. National expert on sentencing and parole, Nicole Porter (Washington, D.C.), and leaders of the faith-based and crime victims’ communities joined advocates pleas for sweeping reforms. “It’s no secret that the New York State Parole System is in dire need of repair. Simply put, the continuous parole denial of individuals who have completed their mandatory minimum sentences, satisfied their required rehabilitative programming, and in the interest of public-safety, been determined to be least likely to reoffend makes no sense and is definitely not a good way to spend taxpayers’ money. We all bear the burden and share a general responsibility for reforming an unjust and broken parole system. To that end, we at Brooklyn Defender Services relentlessly advocate for a more balanced and transparent system, and we thank bill sponsors Senator Rivera, Senator Hoylman, and Assembly Member Weprin for championing these urgent reforms,” said Samuel Hamilton, Reentry Advocate at Brooklyn Defender Services. “As a longtime criminal defense attorney and President of the New York State Association of Criminal Defense Lawyers, I’m honored to join formerly incarcerated New Yorkers and other advocates in calling for critical reforms to help end mass incarceration in New York State. Today, defenders are convening in Albany to urge immediate passage of open, early, and automatic discovery reform (S.1716-Bailey/A.1431-Lentol). We also express our strong support for urgent parole justice measures, including Elder Parole and Fair and Timely Parole. Ultimately, we must overhaul the system from the front end and the back to make it more fair and just,” said Lori Cohen, President of the New York State Association of Criminal Defense Lawyers. The 100+ advocates marched through the Capitol building, rallied on the Million Dollar Staircase, and met with some 30 members of the Assembly and Senate to secure support for the three initiatives—and to introduce them to the people of New York who elected them and are now urging them to make the changes we need in order to bring our elders home, heal our families and neighborhoods, and bring justice to New York. 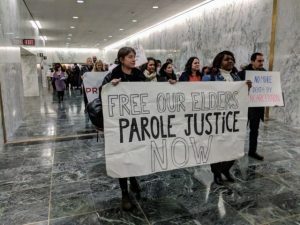 At least three lawmakers added their sponsorship to the Fair and Timely Parole and Elder Parole bills, joining the lead sponsors of the two bills, Senator Gustavo Rivera, Senator Brad Hoylman, and Assemblymember David Weprin. SAVE TUESDAY, May 14, 2019 to join our next major Albany advocacy day for parole justice.